56 THE SHOP JANUARY 2019 Use a calibrated micrometer to measure lifter diameter. Avoid using a caliper. A C PRECISION ENGINE ance, test-install the connecting rods with lubed rod bearings and again carefully rotate the crank, noting any contact or potential contact areas. Try to achieve at least 0.060 inches of clearance between rod big ends and any areas of the block. Note: This is best done by installing and checking one rod at a time. In order to prevent the rod small end from scratching the cylinder wall, and to keep the small end somewhat centered in the cylinder, guide the small end with one hand while you rotate the crank with your other hand (or enlist a helper). Carefully observe the rod big end as it approaches the pan rail, main webbing, etc. Mark any potential contact spots, remove the rod and install it to the next location and repeat. Once all rod locations have been checked, remove the crank, grind the needed reliefs and perform the rod check again to verify. Try to obtain at least 0.060 inches or so of clearance at all of the tight locations. 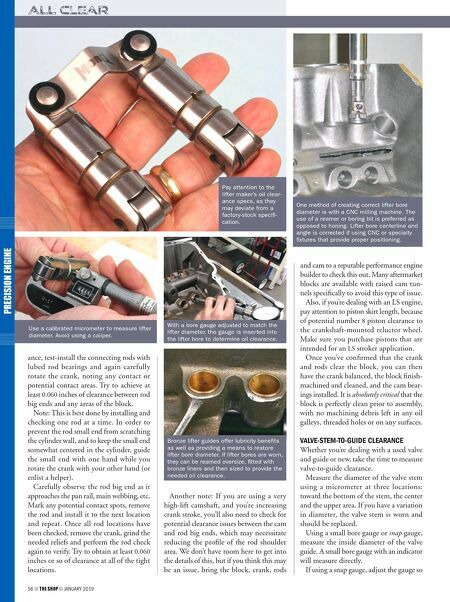 Another note: If you are using a very high-lift camshaft, and you're increasing crank stroke, you'll also need to check for potential clearance issues between the cam and rod big ends, which may necessitate reducing the profile of the rod shoulder area. We don't have room here to get into the details of this, but if you think this may be an issue, bring the block, crank, rods and cam to a reputable performance engine builder to check this out. Many aftermarket blocks are available with raised cam tun- nels specifically to avoid this type of issue. Also, if you're dealing with an LS engine, pay attention to piston skirt length, because of potential number 8 piston clearance to the crankshaft-mounted reluctor wheel. 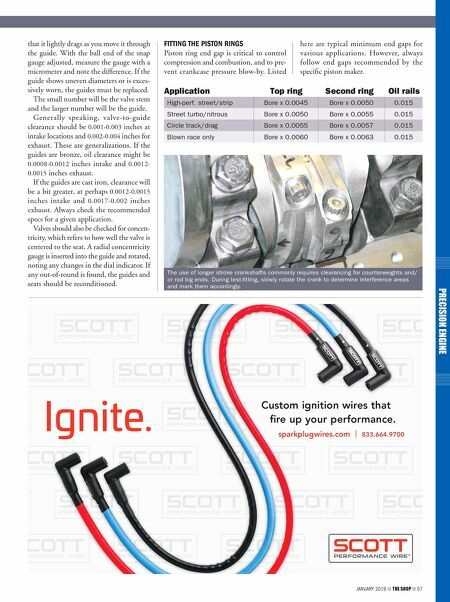 Make sure you purchase pistons that are intended for an LS stroker application. Once you've confirmed that the crank and rods clear the block, you can then have the crank balanced, the block finish- machined and cleaned, and the cam bear- ings installed. It is absolutely critical that the block is perfectly clean prior to assembly, with no machining debris left in any oil galleys, threaded holes or on any surfaces. VALVE-STEM-TO-GUIDE CLEARANCE Whether you're dealing with a used valve and guide or new, take the time to measure valve-to-guide clearance. Measure the diameter of the valve stem using a micrometer at three locations: toward the bottom of the stem, the center and the upper area. If you have a variation in diameter, the valve stem is worn and should be replaced. Using a small bore gauge or snap gauge, measure the inside diameter of the valve guide. A small bore gauge with an indicator will measure directly. If using a snap gauge, adjust the gauge so Pay attention to the lifter maker's oil clear- ance specs, as they may deviate from a factory-stock specifi- cation. With a bore gauge adjusted to match the lifter diameter, the gauge is inserted into the lifter bore to determine oil clearance. Bronze lifter guides offer lubricity benefits as well as providing a means to restore lifter bore diameter. If lifter bores are worn, they can be reamed oversize, fitted with bronze liners and then sized to provide the needed oil clearance. One method of creating correct lifter bore diameter is with a CNC milling machine. The use of a reamer or boring bit is preferred as opposed to honing. Lifter bore centerline and angle is corrected if using CNC or specialty fixtures that provide proper positioning.